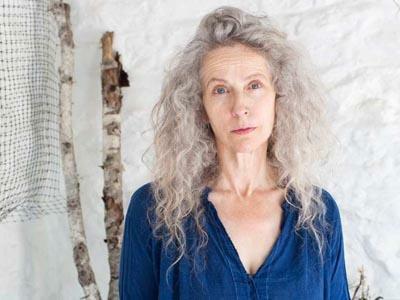 Kiki Smith was awarded the Medal of Art for her longtime contributions to Art in Embassies and cultural diplomacy on November 30, 2012. “I see stars all the time . . . One of the possibilities of art is an invitation to wander in wonder.” –Nikki Giovanni Inspired by Nikki Giovanni, Kiki Smith has produced an influential body of work that is mystical and beautiful, inviting us to reexamine ourselves, our history, and our place in the world. She explains: “I’d rather make something that’s very open-ended that can have a meaning to me, but then it also can have a meaning to somebody else who can fill it up with their meaning.” Smith’s site-specific commission, Moon with Stars II, is in the permanent collection of the U.S. Consulate in Mumbai, India, and the drawing, Moon, is permanently installed in the new U.S. Embassy building in Istanbul, Turkey. Over the years she has lent work to the Chief of Mission residences in Rome, Italy; Stockholm, Sweden; and Windhoek, Namibia; as well as to Brussels NATO in Belgium; The Hague in The Netherlands; and the U.S. mission to the United Nations in New York. Smith’s work was also included in AIE’s 40th anniversary exhibition in Washington, DC. Born in Nuremberg, Germany, Smith is the daughter of sculptor Tony Smith and grew up in South Orange, New Jersey. She was elected to the American Academy of Arts and Letters, New York. Her work is in numerous prominent museum collections, including those of the Museum of Modern Art, the Whitney Museum of American Art, the Solomon R. Guggenheim Museum, and The Metropolitan Museum of Art, all in New York City; the Museum of Contemporary Art, Los Angeles; and the Walker Art Center, Minneapolis.